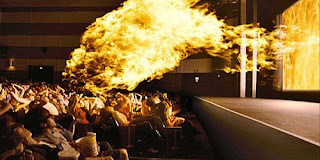 I have never had more fun watching a movie in my entire life. From now on I won’t see any movie unless it’s in 3-D. Just kidding!... but seriously. lol I was excited to hear they were doing this movie in 3-D. A horror flick in 3-D?! How can I pass this up?! 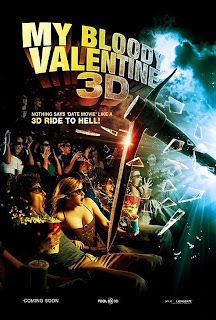 A 1981 remake, My Blood Valentine 3-D is an extremely gory yet fun film that probably wouldn’t have been a big deal if it wasn’t for unusual circumstances. However, My Bloody Valentine 3-D has some special ingredients in its slash-tastic recipe. These ingredients include brains, guts, jaws, blood and various pointy objects popping out of the screen via some very advanced 3-D technology - pickaxes flying at the screen, bullets racing straight at you, flames and falling trees coming right for you. Needless to say it was an exhilarating gore-ride! This film does a decent job keeping the killers true identity hidden until the very end, which was super fun. Of course you have your “who-done-it” guesses - constantly going back and forth, “he did it, no wait, he did it.” It was smart and edgy for being a simple slasher flick. I could have done without a certain scene and/or made it better, but whatever. I thoroughly enjoyed this 3-D spectacular, slash-fest and from what I observed I feel everyone in the audience did as well. 3-D movies rule!! I'm not sure I can forgive you for saying "slash-tastic," but you've certainly piqued my interest in the concept of 3-D slasher films. What a fab idea! I wonder if it will start a trend? It's going to be a good year for movies!